Pet Peeves: Pet Peeve #42: Aretha Franklin’s stylist and a few other people. Aretha Franklin is an extraordinarily popular and profoundly accomplished R&B singer in the United States. Her music career has lasted for decades, and she is honorably noted as the “Queen of Soul”. Aretha Franklin has recently taken time off because of an illness; therefore the Grammy Awards honored her during the opening act. During the tribute, they showed footage of the Queen of Soul in action on the stage, and to be honest, I felt as thought I was watching one wrong outfit after another. It just got worst as the years progressed. 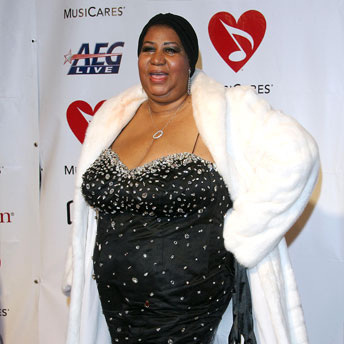 Aretha Franklin can sing, but her choice of outfits has been questioned in the last few years. Who will ever forget the hat she wore at President Obama’s inauguration? NO ONE! To be honest, I blamed Aretha Franklin for these horrible outfits, but I have realized someone else has to be behind the madness. 1) I blame everyone who saw her get dress before she left the house. No one is going to say anything, huh? 2) I also blame her stylist. Who got this apparatus? Since when did strapless and spaghetti strap dresses work for Aretha Franklin, huh? ANSWER ME! I am convinced that Michelle Obama will wear a sleeveless dress in a snow storm, but it is OK. Why? Because her arms are great! No disrespect, but Aretha Franklin can not have her arms out like Michelle Obama. Again, I ask, who keeps buying the strapless and spaghetti strap dresses. ANSWER ME! If I talk about the strapless and spaghetti strap dresses with the gigantic breast hanging out looking like they are trying to leave Aretha Franklin’s chest, we will have another pet peeve. So to everyone watching the Queen of Soul getting dressed, STOP IT! UGH! I know right.... I wished someone would have told her, that just didn't work for her, or could they? The only conclusion we come up with is that, she really loved her body flab and all,but it doesn't take away from the way we love the Queen Of Soul!!! But yes,we have as I'm sure many others have ask that question too.